My Saturday morning tea time is a little more relaxed than the rest of the week, but the tea accoutrements and the ritual are the same. I've used various electric tea kettles for about 15 years. I like this Chef's Choice® because the handle is on the side and not on the top. I bring fresh, drawn, cold water to a rolling boil. We are very fortunate to have great tasting, good quality tap water! 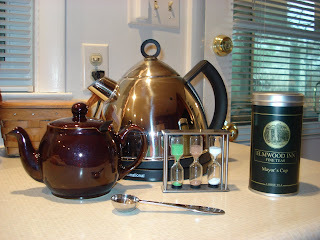 After warming my 2-cup Brown Betty Chatsford teapot with hot water, I measure 2 spoons of my favorite blend of morning tea, Elmwood Inn Fine Tea's Mayor's Cup described as "a classic blend of single estate black teas from Ceylon, Darjeeling and Assam", into the infuser basket using the "1 cup of perfect tea" measuring spoon. I pour the boiling water in the teapot and turn over the "perfect tea timer" with individual timers for 3, 4 and 5 minutes. Instructions on the back of the Mayor's Cup tin say to brew 3 - 5 minutes, or to taste, and remove the tea leaves to prevent over brewing. If I'm lucky, the phone doesn't ring to interrupt this delightful ceremony, and I brew my perfect pot of tea for 3 minutes. Ahh..sip, savor and enjoy! I've yet to make a "pot" of tea. I have my afternoon cuppa with my water boiled in a little "Hot Shot" machine...it boils 1 cup at a time. I've recently got a 6 cup teapot and intend to use it one day soon!